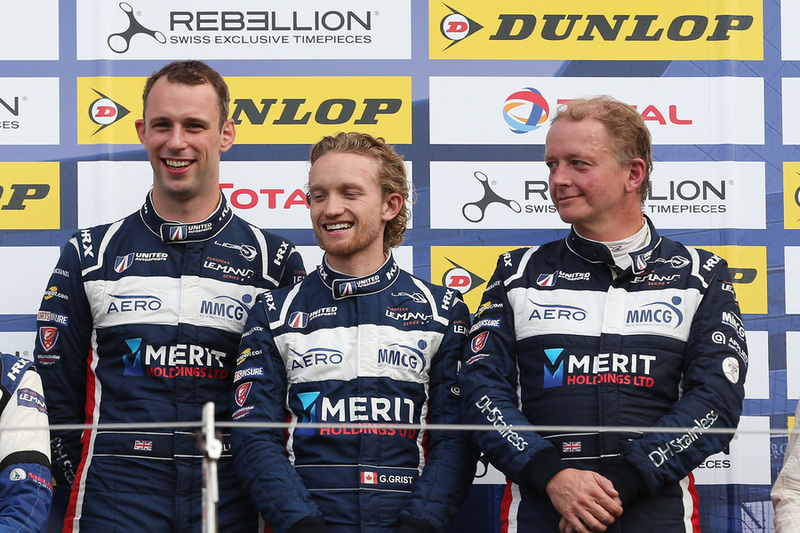 In what proved to be a rollercoaster race for United Autosports’ four European Le Mans Series cars at Silverstone, the #3 LMP3 crew of Garett Grist, Tony Wells and Matt Bell scored their first win of the 2018 season in style. United’s three other cars meanwhile, suffered poor luck, despite all of them being in contention for podium spots in their respective classes throughout the race. LMP2 was a struggle for the United Autosports team. The #32 Ligier JS P217 of Hugo de Sadeleer, Will Owen and Wayne Boyd eventually finished the race 10th overall, despite climbing as high as fourth during the first half of the race. The car struggled for grip throughout the final two hours, after de Sadeleer and Boyd pushed hard early in the race to keep the car on the lead lap and in with a chance of a podium. Bad luck struck the team in the final hour though, after Owen’s stint which ended with him handing over to de Sadeleer for the run to the flag in 10th. The Swiss was hit by a slower LMP3 class car through traffic and as a result picked up a puncture with 24 minutes left in the race, costing the team further time and forcing the #32 to come in for an unscheduled stop after almost a full lap with the puncture. Filipe Albuquerque and Phil Hanson in the #22 meanwhile, were unable to finish. Hanson was forced to take evasive action at the start, dropping him to the back of the LMP2 pack after starting 12th. The Briton made moves during the opening hour to climb back into the top 10, before being forced to retire the car halfway through the second hour, after a clump of rubber flew into the cockpit and set off the fire extinguisher, stopping the engine. In LMP3 the team had bad luck for the 2017 title-winning duo of Sean Rayhall and John Falb in the #2. The reigning champions lost out on their chance of winning through no fault of their own in the final portion of the race, whilst the sister #3 Ligier JS P3 went on to win the class. For much of the second half of the race, United’s pair of Ligier JS P3s ran in formation, 1-2 at the head of the class. The race to that point though, couldn’t have been more different for the two cars and their driving crews. Bell, Grist and Wells controlled the race early in Bell’s stint after the halfway mark. The crew started fourth, and moved up to second after a Grist’s strong first stint. Then, Bell climbed in during hour three and made a daring pass on the leading car into the complex to take the lead. From there, Bell built a comfortable lead for Wells to defend until the end. Over the other side of the garage, the #2 had to stage a comeback drive to make it a 1-2. Rayhall had an off in avoidance of an incident at Turn 1 at the start, dropping him to dead last. But he didn’t give up in pursuit of his first win of 2018 and slalomed through the field all the way to second before handing over to John Falb for the second half of the race. With just the sister car to catch, Falb slowly reeled in Wells, before the final stop, which would have leap-frogged the team to the lead. But the car didn’t start, the duo losing two minutes as a result. Eventually, Falb crossed the line seventh. "It’s been a really frustrating weekend overall for me and Phil. We haven’t quite had the pace and we had that issue with the engine getting killed in the car during the race so I didn’t get a chance to drive. But we won’t give up, we’ll push hard to improve and learn from this weekend. We hope for a better result at Spa." "I think we have a lot of positives to take from this weekend, as we fixed a lot of the issues we were having earlier in the year. We didn’t have the position we’d have liked in Qualifying, we had pace, but we tried to make sure that the car would ease into the race. Unfortunately, though it was difficult to drive, loose on the rear. In traffic it was nice, but overall it was tricky. Then at the end I got tapped by an LMP3, who turned in on me. It was a real shame, we could have scored some real points." “That was certainly my best stint in the ELMS, the starts in these races are always very tight, I managed to steer clear of the mayhem and use the gaps that opened up, fourth to second on the first lap but could see that the leader was pushing very hard, perhaps a bit too hard. We’d talked about strategy, in particular tyre management, and this was a great example of why that proved to be important, I was immediately into tyre management, making sure I wasn’t overly aggressive but keeping up the pace. I could see the car ahead was leaving black marks everywhere and sure enough he was struggling by the end of the stint and I could hand over to Matt in sight of the lead." “The #3 crew really deserved that. It would have been a tight race at the end with the #2, if it weren’t for the issue at the final stop. And the #2 crew had a shorter stop to do at that point, so they probably would have jumped them. But it’s great to see them win, though I’m disappointed it wasn’t a 1-2, as it looked like it would be for almost the whole race. “I must also note that Sean Rayhall’s drive from dead last to second in his stint was masterful, full credit to him for that. It’s something you don’t see often in a field of both quality and equality. He shone.